For as long as I can remember I’ve been an admirer of things whimsical and/or strange, especially when it comes to books and art. 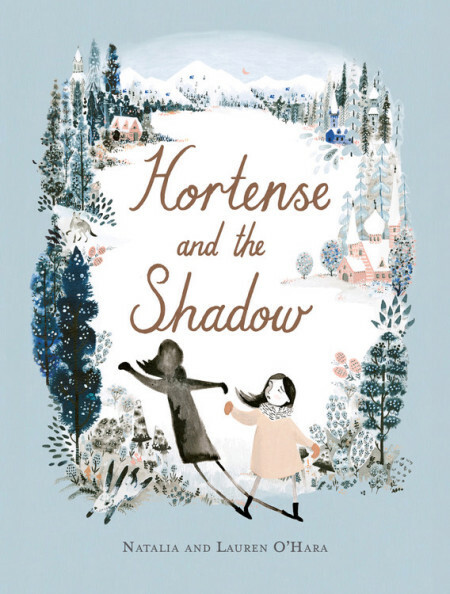 When I saw the cover for sisters Natalia and Lauren O’Hara’s picture book collaboration Hortense and the Shadow, I thought, “That looks like my kind of book.” And when I read it all these months later, I realized I was right! Love when that happens. A haunting, original fairy tale from two dazzling debut picture book talents, in the spirit of Neil Gaiman and Carson Ellis. Hortense is a kind and brave girl, but she is sad–even angry–that her shadow follows her everywhere she goes. She hates her shadow, and thinks her shadow must hate her too. But one cold, dark night, when bandits surprise her in the woods, Hortense discovers that her shadow is the very thing she needs most. This stunningly illustrated story stirs the soul with its compelling, subtle exploration of self-esteem, self-identity, and finding inner strength. Hortense lives in a large house deep in the snowy woods, but she’s sad because she hates her shadow. It follows her everywhere! One day, she becomes so upset that she cuts her shadow off. Then! Well, then she sings with happiness. Until… something terrible arrives in the night. Hortense learns that her shadow, like her sometimes sad, mad, and wild feelings, is another part of herself. Hortense and the Shadow is a wintry sort of book, with a bit of a contrary personality. Hortense herself is a singular, stubborn figure: she’s kind and brave, and at the same time deeply unhappy with a part of herself. There are sinister forces at work, as well as magical. Hortense acts – in what adults might label a foolish way. Overall the book is a bit odd, a lot creative, with a dash of menace mixed in (like a proper fairy tale). While the prose is lovely (“sad as an owl” is my favorite new simile), the art is, hands down, the best part of this book. The cover has rose gold foil detailing on the dust jacket and the boards themselves are a light peach. Inside, Lauren O’Hara has created beautiful, muted watercolor illustrations full of Eastern European-style buildings, gingerbread-like detailing, and woodland creatures. Eagle-eyed readers will also notice menacing men hiding in margins, adding to the juxtaposition of beauty and darkness throughout. All in all, Hortense and the Shadow a delightfully dark fairy tale of a book in a charming package. Recommended for: fans of fairy tales – all ages, anyone who has enjoyed Bethan Woollvin’s picture books, and those looking for magical stories no matter the time of year. I’ve had a copy of Kimberly Derting, Shelli R. Johannes, and Vashti Harrison’s picture book Cece Loves Science sitting by my desk at work for a few weeks now. Whenever anyone sees the title, they smile and ask 1) if I love science, and/or 2) if I know the authors (Cece is one of my nicknames). That in turn makes *me* smile, and the circle is complete. I’ve found that the combination of cute cover and title make this book nearly irresistible for adults to page through, and I think kids will enjoy it as well. Cece’s parents say she was born curious. She asks: Why? How? What if? When her teacher, Ms. Curie, assigns a science project, Cece knows just what to ask—do dogs eat vegetables? She teams up with her best friend, Isaac, and her dog, Einstein, to discover the answer. They investigate, research, collect data, and analyze, using Einstein as their case study. Their final conclusion is surprising, and a lot of fun! Illustrated by Vashti Harrison, whose Little Leaders: Bold Women in Black History is a New York Times bestseller and an NAACP Image Award winner. Cece Loves Science is just right for fans of Rosie Revere, Engineer; What Do You Do with an Idea? ; and anyone who loves learning. Cece loves to ask questions about the world, to find out how and why things work. When her teacher asks students to try an experiment and record their results, Cece and her friend Isaac brainstorm ideas. Are bears ticklish? Do pigs know that they are smelly? But eventually Cece and Isaac decide to test if animals eat vegetables, and experiment on Cece’s family dog Einstein. Through the process Cece and Isaac learn about observing, asking the right questions, thinking outside the box, and never giving up. Cece Loves Science is a charming, informative picture book featuring a curious scientist-in-training as main character. Cece's questions, frustrations and discoveries will please teachers, librarians, parents and kids (especially those learning about the scientific method for the first time). This title is a great candidate to read aloud during science- and STEM-related classroom units. Cece’s teacher Ms. Curie assigns a project worksheet that is very similar to ones found in most science lesson plans, and the folks at HarperCollins have created a fun tie-in activity kit for download as well. A couple of other things that stand out: Cece is biracial girl from a blended family, and it’s great to read about her and her friend Isaac carrying out their experiments creatively in a supportive family environment. I also appreciated the final page of the book, which is a glossary of terms, or “Cece’s Science Facts” – this will prompt further interest in famous scientists and branches of science. Finally, I think this would be a fun read-aloud book or even a good candidate to act out – there’s dialogue assigned to each character that would be ideal for doing voices with. Let’s talk about Vashti Harrison’s art! Harrison’s illustrations were created in a digital medium, and the effect overall is colorful and soft (not line-heavy) – with cute human figures and the feel of a well-drawn animated short. In addition, the book design pops – I loved the endpapers and the softer crayon-drawn figures on some pages that represented Cece’s internal thoughts. Great art to match a good book, in other words! 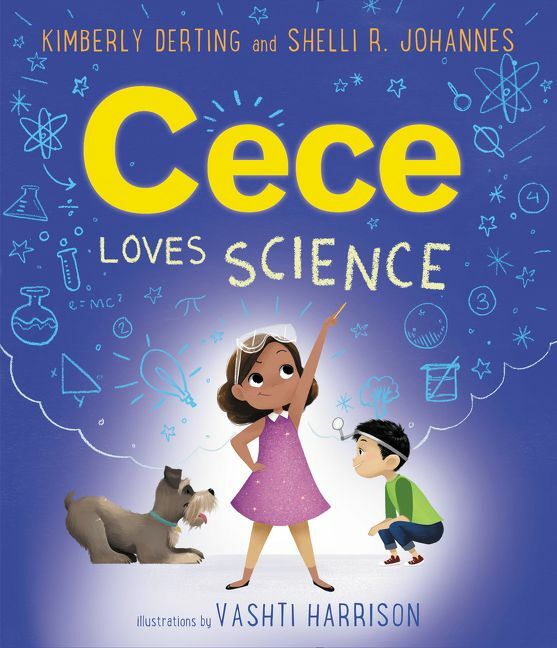 In all, Cece Loves Science is a fun science-laden adventure that will appeal to 5-8 year olds and pair well with Izzy Gizmo and Ada Twist, Scientist.